It seems, on the surface, that I don't do a lot of cooking. Au contraire, I actually do love cooking and do so quite often. However, there are times when it just ain't practical to do so. Now, going out to eat is all fine and dandy (since I do a lot of that anyways), but it isn't the healthiest option most of the time. Therefore, I look to Japanese restaurants, Pho joints and sometimes wonton noodles. I know, I know, there are bad things to eat at these places too as well as the sodium content, but they are better choices than fast food. 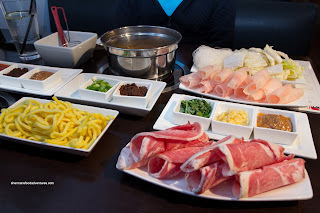 This time around, we thought hot pot would satisfy the somewhat "healthier" criteria. And besides, it's like cooking your own food anyways. Now, not an AYCE place either because that defeats the purpose of eating healthier. 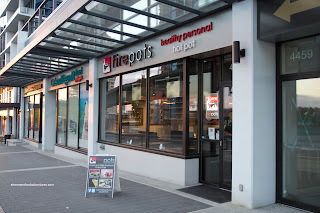 So, we ended up at Firepots, which features individual hot pots, much like Gokudo Shabu Shabu in Richmond. 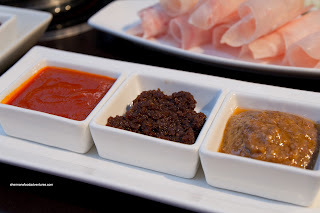 Now, unlike Gokudo Shabu Shabu, Firepots doesn't offer up pork's blood or tripe. Rather, their appeal is to a much broader clientele. Their menu is simple: pick a broth, pick a meat, pick some veggies, pick a noodle and various sauces. Each item is priced a la carte, so if you don't watch it, it can get up there. 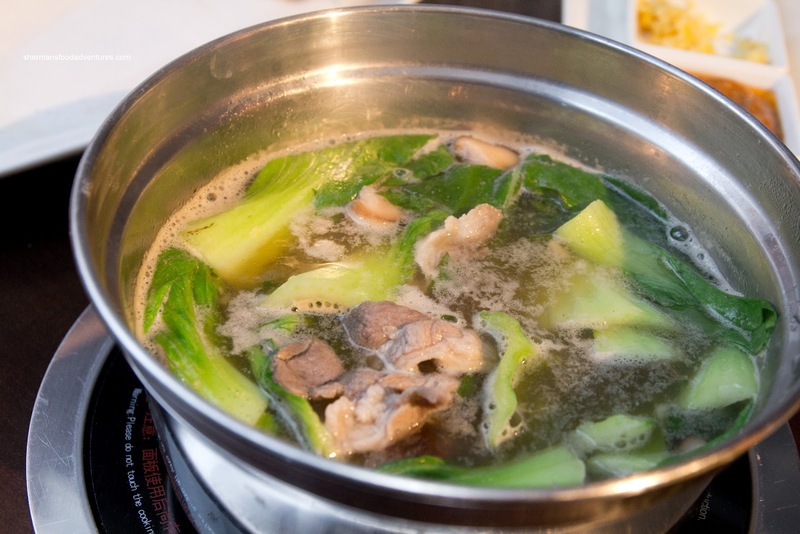 For myself, I had the Fire-Roasted Meat Broth with Lamb, Shiitake and Oyster Mushrooms, Shanghai Bak Choy, Ramen Noodles (which looked more like Shanghainese thick noodles) and a selection of sauces). Viv had the Satay Broth, Chicken, Sui Choy and Vermicelli. We found the portions to be modest for the price. There was nothing amiss with the ingredients as we found them to be fresh and vibrant. The meats were tender as well. My broth was on the saltier side and it wasn't as flavourful as the name would suggest. With all the food you see in the pictures (except for my veggies), the total before tips was more than $31.00. Compare this to Shabu Shabu (which costs around $10.00 and Posh (which costs only $15.88 for AYCE), this was not a good value. Too bad really since the concept is okay and the food and service wasn't bad.